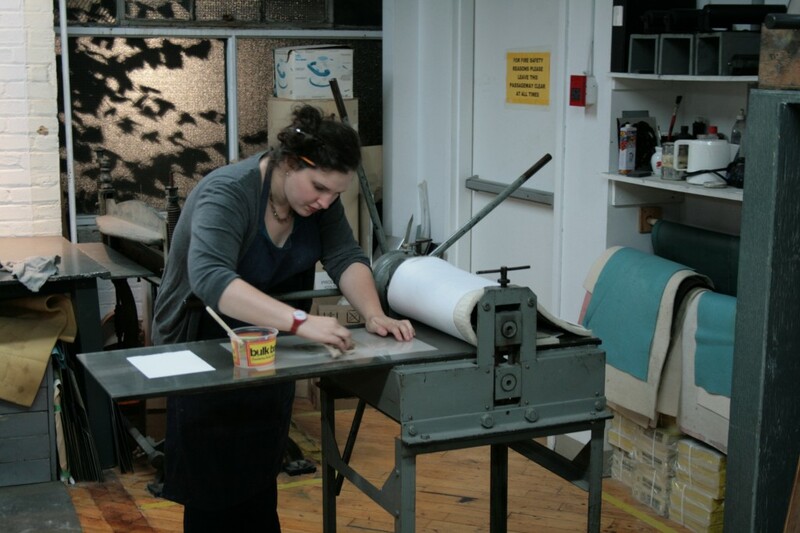 Of the many approaches to intaglio printing there are three that are primarily line processes and closely related to drawing techniques. 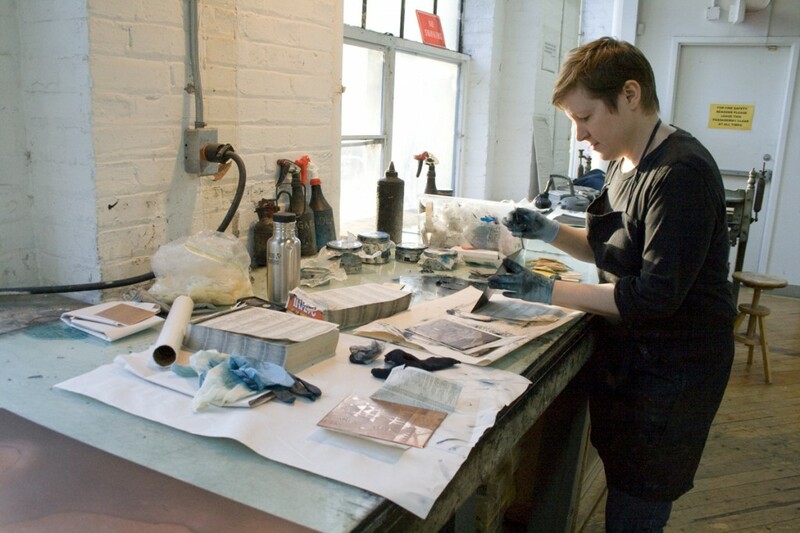 They are Engraving, Etching and Drypoint. Other methods used to achieve tonal variations are Mezzotint and Aquatint. 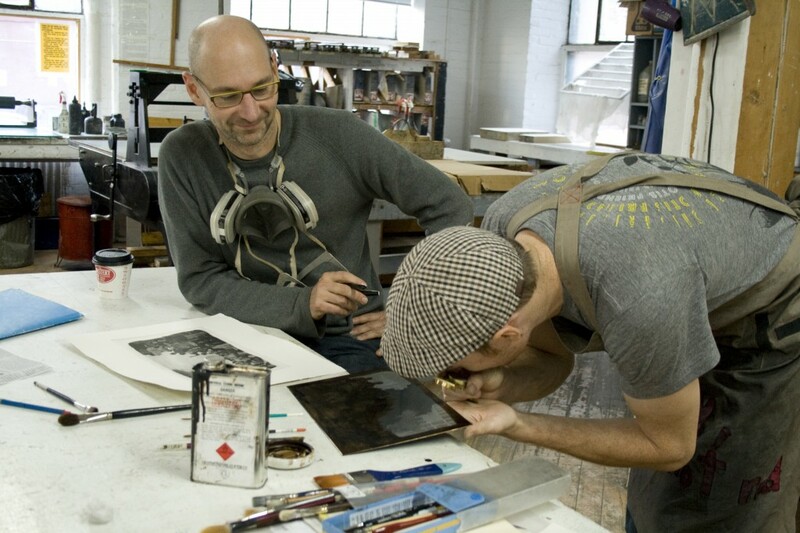 In intaglio printing, a plate, usually of metal (copper or zinc), is used and the lines or areas that create the image are incised into the plate by sharp tools or bitten into by acid. 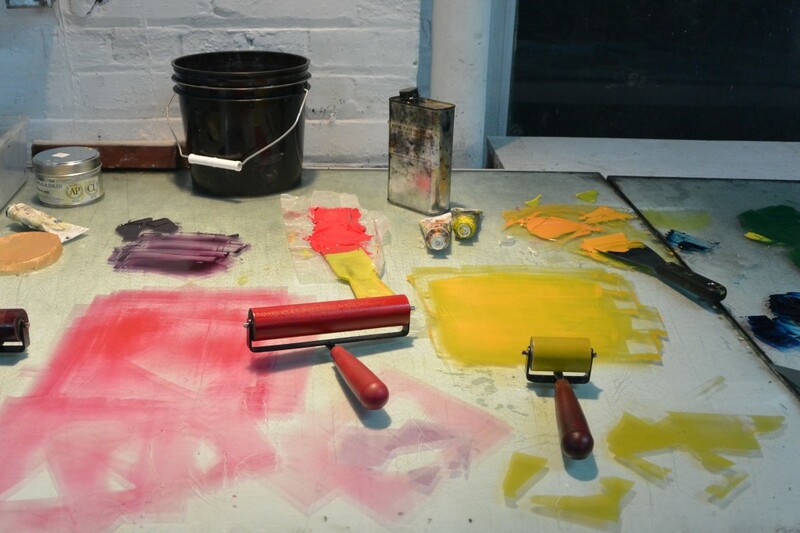 Once the plate has been fully prepared and inked, it is “pulled” through the press under great pressure, forcing dampened paper into the grooves to pick up the ink and thus the image. The marks are incised onto the plate with a variety of metal working tools called burins. No acid is used in this method. The plate is then inked and printed. Until recently, this method was used most often by commercial printing houses because of the plate’s ability to withstand extremely large editions. Engravings can be found as the black and white picture plates in many old books. This method requires the use of acid in the making of the plate. The plate is covered with a acid resistant ground. The image is drawn onto the plate, cutting through the ground and exposing the metal. The plate is then immersed in acid, and the exposed areas are “bitten” into, creating the line which will hold the ink. The longer that the plate sits in the acid, the deeper, and therefore the darker the lines will print. This enables the printmaker control over the printed line’s tonal range, from very faint grey to dense black. By drawing directly onto the plate with a steel needle, the printmaker produces a “furrow” or rough line that leaves metal burrs on either side of the groove. These burrs hold ink and print in a characteristically fuzzy manner. This is a positive quality of a drypoint, however, this method generally cannot withstand editions over 20 , as the pressure used in printing flattens the burrs, and reduces the ability to hold ink. The printmaker sprinkles a fine rosin powder over a clean metal plate. The powder is then heated until melted, then cooled. The result is a dot-like pattern that is resistant to acid. The plate is then immersed in acid, as in etching, to be bitten. When the rosin is removed, the plate will print in wider tonal areas, much finer than etching alone will allow. If black ink is used the resulting texture is like a microscopic white stone wall with black mortar. The plate is first manipulated to produce a solid textured surface that will print an even black. The plate is usually roughened by a small metal spade with sharp teeth (a rocker). This roughened area holds the ink to produce a deep velvety black. To produce a white or lighter area, the plate would be burnished to a polished surface that would hold less or no ink.